The MCH Training Program was the second MCHB-funded initiative to be conducted by NCEMCH. The MCH Training Program: An Evaluation, is the product of the second phase of the evaluation of the program, and builds on Building the Future: The Maternal and Child Health Training Program, published in March 2000. Phase one of the analysis of the MCH Training Program, which resulted in Building the Future, described the 14 training priority areas (Adolescent Health, Behavioral Pediatrics, Communication Disorders, Continuing Education, Historically Black Colleges and Universities, Leadership Education in Neurodevelopmental and Related Disabilities [LEND], Nursing, Nutrition, Occupational Therapy, Pediatric Dentistry, Pediatric Pulmonary Centers, Physical Therapy, Schools of Public Health, and Social Work), traced the evolution of the priorities over time, and identified common themes across the training projects. 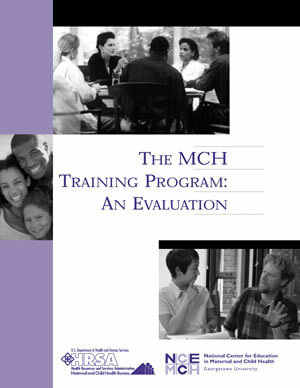 Phase two of the evaluation, the results of which are summarized in the newly released document, analyzed the distinguishing characteristics of each of the long-term training priorities, assessed the accomplishments of the MCH Training Program, and developed recommendations to help the MCHB make future assessments of this category of grants. The full report and The MCH Training Program: An Evaluation - Executive Summary 560k, can be downloaded as PDF files. Also available for downloading are technical documents used during the evaluation, such as the record review data collection form, site visit interview questions, Title V director focus group questions, and former trainee interview questions, as well as the findings of phase I of the evaluation and individual training priority fact sheets.